This has been a very good year for completing my fitness goals. I have been able to lose a significant amount of weight, break my high school running times in the 5K and half marathon, and build good strength through pull-ups. Until this weekend, however, I had been neglecting my cycling. Most of my Strava friends are cyclists, and I admit to a bit of jealousy when I see their rides on my dashboard. With the new kiddo at home, it’s easier for me to go out for a 30-60 minute run near my home than to pack up the bike, drive to Stanford or Canada Road, and cycle my favorite routes. Fortunately, I have Dan Connelly and the Low-Key Hillclimbs to temporarily get me out of my running and pull-up habit, if only for a weekend. I received Dan’s email about the start of the 2015 series last week and quickly signed up for the annual kickoff event up Montebello Road in Cupertino. Last year I set a PR in the Low-Key series 41:13 (40:19 according to Strava). Since last October, I had lost an additional 12 pounds, going from 146-148 to 134-136 pounds. Would the weight loss be enough to get me under 40 minutes? Would I be able to best my all-time PR of 39:15-39:30 that I set back in September, 2003? Though I was cautiously optimistic, I knew there was only one way to find out — climb it! 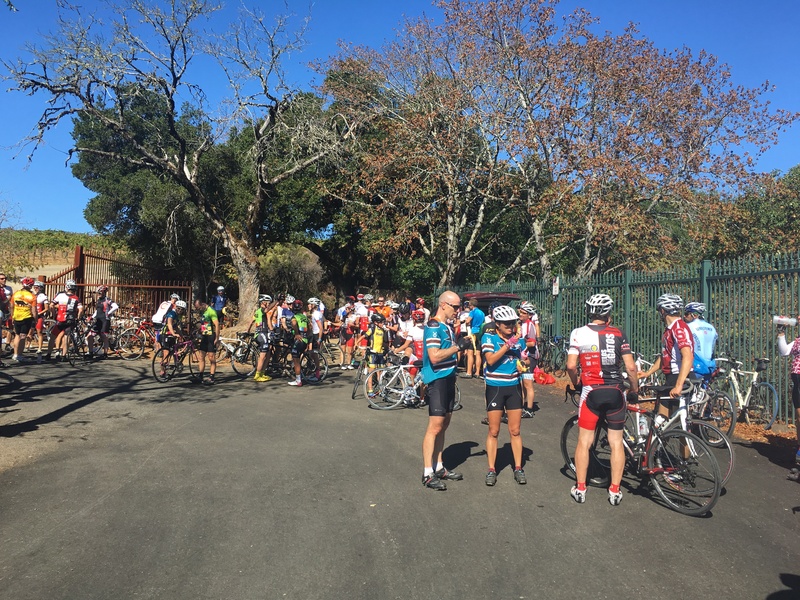 Cyclists gather at the start of the ride up Montebello. On Saturday morning, I arrived at the parking lot off of Stevens Canyon Road shortly after 9:00 am. The air was crisp and the forecast signaled a relatively cool day compared with last year’s blistering heat. I saw my Low-Key friends, Garrett, Stephen, Han, Larry, and Christine. Dan and Richard were volunteers this week, so they were not cycling. I warmed up with a slow ride to the base of Mt. Eden with Stephen, Han, and Garrett. By the time I got back to the start-line at the second parking lot, it was 9:45 am. I filled up my bike’s tires and waited in the back of the group for the next 25 minutes, mentally preparing myself for the 40 minute, 5.3 mile, and 1940 foot ride up Montebello Road. During the mass start events, Low-Key riders organize themselves by groups. The first group are the fast cyclists, followed by groups 2, 3, and 4. The fifth and final group are for the “slow” riders, and that’s where I placed myself again. Montebello is pretty unrelenting for the first two miles until it evens out for 0.75 miles at the school. The last two miles aren’t as bad as the first, but they are still pretty steep… One thing that I wanted to try differently from previous rides was not spinning on the easiest gear too much. I have a compact crank on my aging 1995-era Trek 5200 and a 12-25 8-speed cassette. I stuck with the 19, 21, and 23 cogs for the majority of the ride. I figured I’d rather spin more slowly but go faster than spin quickly but go more slowly up the climb. Besides the cooler weather, they have paved the road near the top of Montebello and I only brought one water bottle with me on the ride. Han told me before the event that he was gunning for 36 minutes. I figured if I could keep him in my sights, I would be in good shape to break 40 minutes. Within minutes of the start of the climb, I could tell from his steady and strong pace that I was not going to keep up with him. I then focused my pedaling attention on this kid who must have been 12 years old (turns out he was 14 years old and completed the climb in 34:30!). Spinning his gears so fast, the kid was also going too fast for me. So, I looked at the next guy, and the next guy, and the next guy, until it was basically just me and the road all by myself for 10 meters ahead and behind. I settled into a hard yet manageable pace. Honestly, I didn’t feel like I was going that much faster, and the flat section and last two miles were especially hard on me. I felt more comfortable and powerful riding out of the saddle, but I only did that on the really steep portions. Were I to ride Montebello again, I’d go all Pantani more often. Maybe it would feel more like running. I was amazed at the two participants, John Burton and Lisa Penzel, who ran up the mountain and finished in 49 and 51 minutes! I might make it a goal next year to compete in the running division; I just need someone to drive me back down, since I know my legs will be shot! My time according to Strava was 38:43 and the Low-Key official time was 39:09. I broke 40 minutes and bested my PR up Montebello! Congrats also go out to Stephen, who confided in me that he had no climbing legs this year and thought he would be closer to 50 minutes than the 40:40 he crossed the line at. Overall, I’m pleased with my performance, and I know I can do better. I credit this ride to my improved overall fitness; were I to have more cycling miles under my belt, I think 35-36 minutes is do-able. That would put me right around the middle of the pack, which is fine with me. I won’t be able to attend next’s week climb up Page Mill Road, but I’m hopeful that I’ll be able to make Old La Honda on November 14. My fastest time up OLH was somewhere around 21:40 some 18 years ago. I’d be happy to get 22 minutes at this point. Both Stephen and I were happy with our performances today up Montebello. Cyclists hang out after reaching the summit of Montebello Road. Great job, Adam! Under 40 minutes AND PR’d! It sounds like your 8.2% reduction in weight last year translated into a 4-5% reduction in time (depending on whether you use the Strava or official times). Hope you can do the OLH climb! The LKHC time includes time for anyone except the first few riders to reach the base of the climb once the horn sounds: an unavoidable “tax” of mass-start climbs. So for climbing comparisons it’s best to exclude these seconds. The middle mile on the climb doesn’t reward lightness as much as the rest, so expect some depreciation from a pure 1:1 advantage there. But I think at least around 2% would be a loss in specificity. I know for myself I can’t simply hop on a bike from a state of primarily running fitness and expect to be anywhere close to my best. In fact I’d say the specificity part is more like 5%. 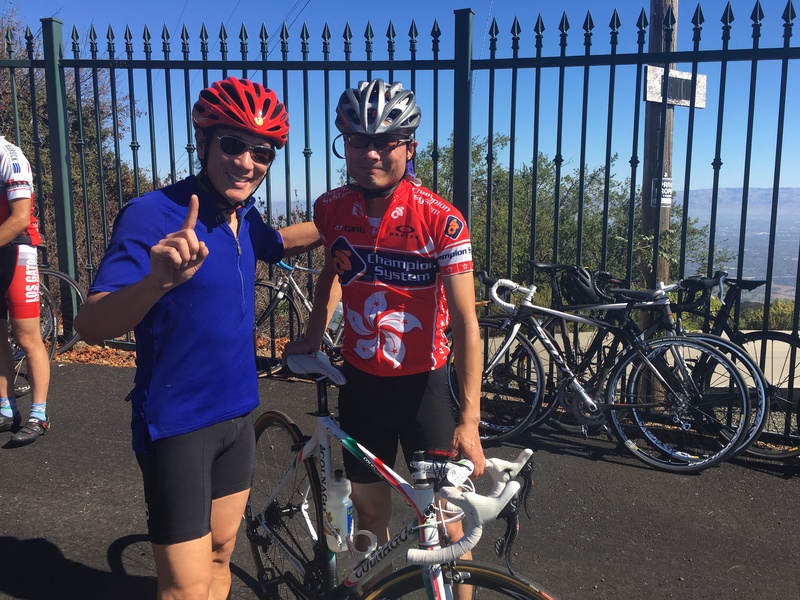 So very nice riding, Adam, and thanks for the great blog post!